Black_Folders is rated 4.6 out of 5 by 10. Rated 5 out of 5 by DianneB from JAM Black Plastic Folders I love the ease of navigating JAM's site. The folders I was looking for to fill a very specialized need were reasonably priced and the turnaround phenomenal. The folders have been the perfect solution to the loss of a similar item from a high-end industry supplier. Thank you JAM!! Rated 5 out of 5 by Da Man from OUTSTANDING PRODUCT! Sturdy. Professional. Could not find ANYWHERE else but JAM. Not happy about receiving future emails via default though. Rated 5 out of 5 by glossylover from LOVE THE GLOSSY!! I love the glossy texture of these folders, fantastic!!!! Rated 5 out of 5 by AprilH from Great Presentation! These folders are sturdy and look very professional. I also love that they have a slot for a business card inside and it's very easy to slide the card in there, so of them are so challenging. Highly recommend for distributing promotional material! Rated 5 out of 5 by Rsherrill from Excellent I really appreciate your fast and efficient customer service. The linen folders was exactly what I wanted and great quality too. Rated 5 out of 5 by Ty P from Annual Purchase I host a Retreat every year & comforted by the fact that we can rely on jam paper to always provide us professional product year after year, regardless as to what color theme we choose!! Rated 5 out of 5 by AnnMarie615 from Colorful Plastic Folders I bought these for my children for school - so glad I bought extra. They are so durable, my husband and I are using them for our construction. Our Black Linen Folder has a 100 lb paper weight. It's extremely sturdy, a customer favorite! Is the business card slot on just one pocket or both? It is on one pocket. Thanks for the question! what is the thickness of this material? Do these folders come in a pack of 12 or is it just 1 folder? If I order quantity of 1 is that 1 folder or 1 pack of 12? These folders are sold individually. If you order a quantity of one, you will receive one folder. Thanks for your question! DO YOU have the large capacity linen twin pocket folders? We do not have any linen folders that expand. We would approximate 10 sheets fitting in each pocket. We do not customize or print on our folders, sorry for any inconvenience this may cause. Black Folders mean business and everyone knows that business never stops. All of our folders are long-lasting and durable, the perfect fit for your never ending duties at work (or at home). These professional pockets will let your company conventions, your practical presentations, even your handmade home projects stay protected and stylish at the same time - the perfect combination. With over ten options to choose from, you'll be sure to find the right one for you. From our unique finishes like glossy, pinstripe, linen, metallic and more to our 3 hold punch options and folders with clips. We also have a collection of handmade recycled folders made from India! So pick your favorite ... if it's possible - if not choose more than one! With our great prices, you'll be sure to want more and more and more and more. 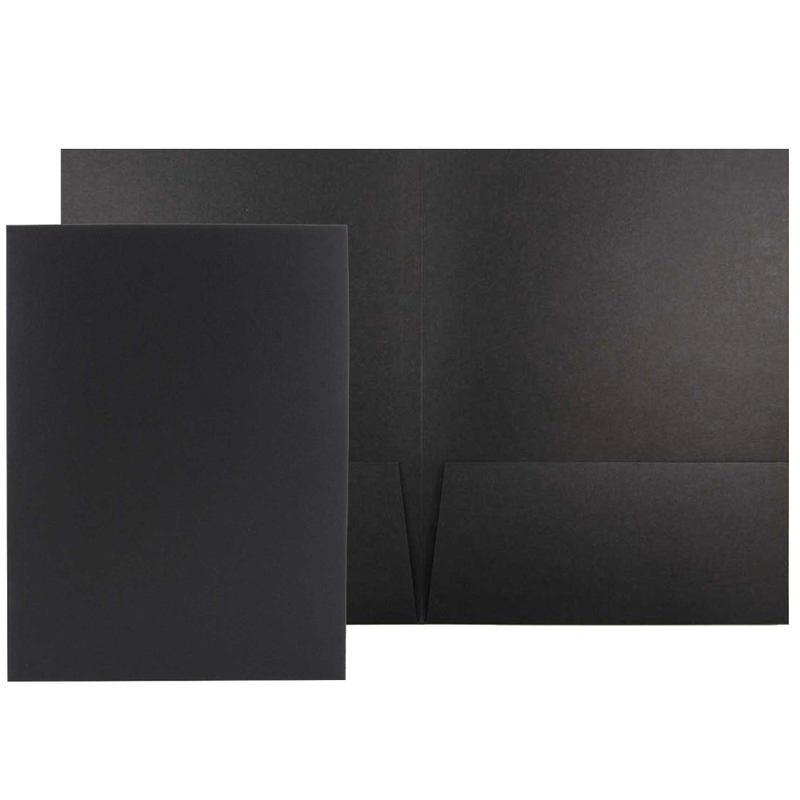 Black Two Pocket Folders measure 9 x 12 and comfortably hold all standard size letter paper.